A majority of Americans say the U.S. should withdraw all of its troops from Afghanistan before the 2014 deadline set by the Obama administration, according to a new poll. The CNN/ORC International survey released Friday indicated only 25% of Americans support the war in Afghanistan, a new all time low. Most Republicans even voiced opposition to it, an unprecedented detail in the entirety of the decade-long war. 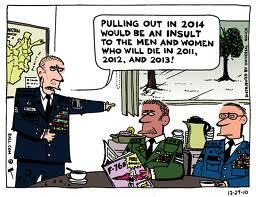 In denial of the abundant evidence of failure, a full 34% of those surveyed amazingly said America is winning the war. The steep decline in support for the war has something to do with a number of high profile outrages occurring one after the other. In recent months, U.S. soldiers were video-recorded urinating on Afghan corpses, U.S. soldiers burned Muslim holy books, prompting nationwide protests, and the latest controversy comes from the savage massacre of 17 Afghan civilians by Staff Sgt. Robert Bales and possibly several more unnamed criminals. Hey, KR (chuckle), you have good points, there. But about heroin, if it were free to produce and use for any American, if the price came way down, if Americans were prosecuted for the harming or damaging results of their actions rather than for the actions themselves, would there be any heroin use in America? Probably there would be. But it would be self-regulating. Why? Because those who did actual damage or actually harmed someone would be in prison or executed. As it is, probably the majority of our law in America exists to prosecute and persecute people because they could POTENTIALLY do damage or harm. This is with regard to ALL American law... not only drug law. Take a look and see. Examine every law in America to see if it is a law against someone potentially harming or damaging, or if it is a law against actually harming someone or damaging his property. Since American laws are mostly against potential harm and damage, how much more will not our national war mongers act against those of other nations for nothing? Come on Americans! Who is better qualified to control the worlds opium market but the international banking cartel? Do we want heroin selling so cheap on the streets of our cities that there will be little money left to put into our countries black projects?